The last direct acceptance is Jimmy Wang, ranked 441st. Cipolla’s results have been dire lately, but last week he had somewhat of a resurgence he will perhaps be able to build on. The former world #70 reached the semi-final in New Delhi, so perhaps he can cause some troubles against the fifth seed here. 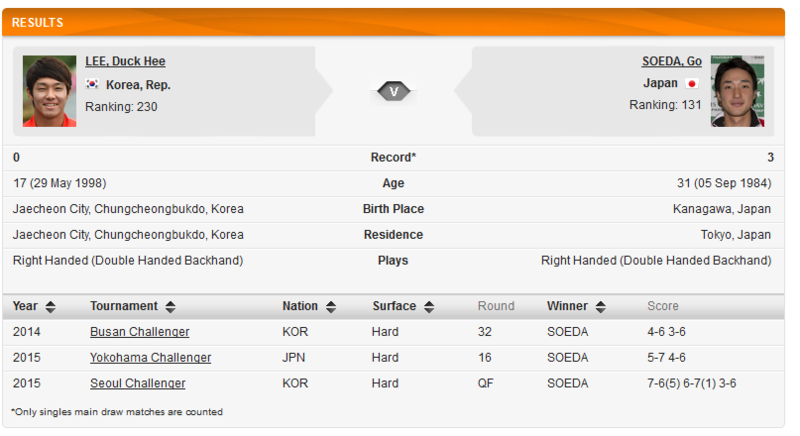 A potential clash of generations awaits in the quarterfinal, with 31-year-old Go Soeda and 17-year-old Duckhee Lee on course to meet. They played each other three times, with Soeda winning all of them, but Lee got closer on each occasion, so perhaps he can finally go all the way this time. If Moriya is able to survive his opening round against Cipolla, a very familiar face might await him in the quarterfinal, top seed Yuichi Sugita. The two have met ten times, with Sugita leading 6-4. Second seed Tatsuma Ito is the clear favorite to go through to the final here, although he has a tricky first round opponent in Ze Zhang. Nevertheless, he is expected to go through in this half, which also features Luke Saville, Ti Chen and Yan Bai as outsiders. The last direct acceptance is Rankumar Ramanathan, ranked 211th. Can 34-year-old Chiudinelli continue the great form that saw him win the Wroclaw Challenger last week? Ramanathan started out the year great by reaching the quarterfinal at the Chennai 250 event, but hasn’t won a match since, so it isn’t a bad draw for Chiudinelli. 36-year-old Hernych is the man who fell to Chiudinelli in the Wroclaw final and guess who Hernych can potentially face in the second round? Exactly, Chiudinelli. It would be a nice little story and surely is possible given Pavlasek’s limited expertise on indoor hardcourt. One of Chiudinelli and Hernych might reach the quarterfinal, but it’s hard to imagine them making back to back deep runs at their age. Fourth seed Daniel Brands is placed in this section as well and has a great opportunity to reach the semi-final. His opponent there is hard to predict, with several players having a good opportunity. Top seed Filip Krajinovic faces a tough first round opponent in Daniel Evans, while youngster Andrey Rublev and Kenny De Schepper also have an excellent chance to advance. Pierre-Hugues Herbert won the Bergamo Challenger two weeks ago and after a spectacular first round loss against Farrukh Dustov in Wroclaw last week, 6-7(4) 7-6(5) 6-7(3), he should be ready for another deep run. He certainly has a comfortable enough draw to do so. Herbert should at least be able to reach the semi-final, where he will likely reach one of Yoshihito Nishioka, Vincent Millot or Karen Khachanov. Posted in: ATP, ATP Challenger, Chris De Waard. Tagged: 2015, atp, challenger, Cherbourg, Kolkata, Kyoto, recap. Top seed James Duckworth finally looked to have overcome his fear of entering the top 100, as he won his first three matches, something he had not done in his previous three Challengers. Even worse, he failed to win back to back matches. In the bottom section of this half, #3 seed Ruben Bemelmans had a rough tournament, needing three sets in his three opening matches to advance to the semi-final for an encounter with Duckworth. In his quarterfinal match against qualifier Richard Becker he came the closest to defeat, edging him out 6-7(5) 7-6(8) 6-2. The encounter between Duckworth and Bemelmans went to three sets as well, but this time with Duckworth as the winner, 2-6 6-3 6-1. In the bottom half last week’s New Delhi winner, Somdev Devvarman, couldn’t survive his tough opening round against countryman Ramkumar Ramanathan, which wasn’t too surprising. Amazingly enough the match ended exactly like their previous encounter in Chennai, with Ramanathan prevailing 4-6 6-3 6-4. Ramanathan won his next match as well, but then fell to Ti Chen in a very close match, 6-4 3-6 7-6(5). Chen in his turn fell to #6 seed Radu Albot, who had already impressed by beating Yuki Bhambri and #2 seed Alexander Kudryavtsev back to back in the second round and quarterfinal. In the final Albot continued his remarkable run, beating Duckworth 7-6(0) 6-1 to claim his second Challenger title. This resulted in a new career high ranking for the Moldavian, rising twenty-one spots to #143. Duckworth is now coming really close to the top 100, going up seven spots to #104. A remarkable incident occurred during the second round match between qualifier Hiroki Kondo and #8 seed Ben Mitchell, when Kondo tore his calf while he was leading 6-4 5-4 30-0. He won that point and took a lengthy medical time-out at 40-0, after which he still managed to win the match two points later. Naturally, he had to withdraw from his quarterfinal match against #4 seed John Millman. Millman wasn’t bothered by the lack of rhythm that withdrawal, as he beat #2 seed Tatsuma Ito comfortably, 6-3 7-5, to secure himself a place in the final. In the top half #7 seed Michal Przysiezny was having a very good run, something that became rare during his drop from #57 of a year ago to his ranking of #185, with which he started this tournament. Przysiezny beat top seed Go Soeda 6-4 6-2 in the quarterfinal and took out countryman and surprising semi-finalist Andriej Kapas 7-6(5) 6-4. In a high level final, Przysiezny managed to take out Millman as well, claiming his eighth Challenger title. This also meant a return into the top 150 for the Pole, at #149. Millman is nearing his career high ranking of #126, obtained in 2013, with a 137th spot, a rise of eleven. Benoit Paire immediately let his presence be known in the early stages of the tournament, hitting a remarkable smash while sitting on his knees. Other than being merely flashy, he was effective as well, clinically taking out top seed Kenny De Schepper in the quarterfinal, 6-4 6-2. #4 seed Farrukh Dustov was unable to build on his title run in Wroclaw last week, falling 6-2 6-3 to Aldin Sektic in the first round. #5 seed Nicolas Mahut also had an early exit, painfully losing 6-3 6-1 to wild card Enzo Couacaud in the second round. It took Paire in the semi-final to stop the young Frenchman, with a convincing 6-4 6-1 scoreline. #2 seed Steve Darcis had to retire with an abdominal injury during his second round match against Maxime Teixeira, while leading 4-2 in the second set after having lost the first 7-6(5). #7 seed Norbert Gombos took advantage by beating Teixeira in three sets in the quarterfinal, after which he took out Maxime Authom 6-4 6-1 for a place in the final. Here he faced Paire, who was marked the clear favorite, but things turned out differently, as Gombos won 6-1 7-6(4) to win his first Challenger title. Having lost his four previous finals, this must have been a relief. It also means a new career high ranking at #117, improving five spots. Paire is nearing the top 100, rising eleven spots to #107.